Lynora is a well respected MLD Practitioner and Lymphoedema therapist who is the current administrator of MLD UK. She was one of the first MLD ladies to take on DEEP OSCILLATION® - A close friend of Sossi Yerissian who had "waxed lyrical" about DEEP OSCILLATION® so many times...Lynora had to have one! 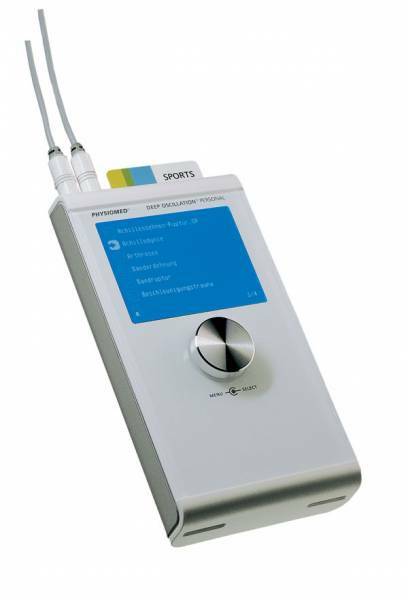 "On a bright morning in May 2009 I took delivery of my Hivamat200 Deep Oscillation Therapy Unit. That afternoon I used it for the first time on a client - she was keen to know all about it, and was genuinely impressed with the results by the end of that single treatment. Until then she had relied on MLD and bandaging to maintain the lymphoedema in her arm (and it always worked well). However, since we started using the Hivamat200, bandaging has not been required, and her appointments are now every eight instead of every two weeks. She is meticulous with SLD and skincare in between, which is essential for self-management of the condition. She was my first 'success' with the device and there have been many since. I became very excited after working on a client who has lipoedema. As many MLD therapists will know, this condition can be exasperating, not just for the client, but for the therapist too, as improvement in the condition can take a long time. I have been seeing Mrs M for some years, doing twice yearly 10 day CDT treatments as well as monthly treatments. She is very compliant, and keeps the bandaging on between the daily CDT appointments. The results have been OK, but nothing outstanding - until I used the Hivamat200. I wouldn't go so far as to say it 'revolutionised' her treatment, but something pretty close! She enjoyed the treatment immensely, and found it profoundly relaxing (she has a very stressful job and is carer for a family member, so physically tired most of the time). The volume loss was quite spectacular for lipoedema and she was able to go into OTC compression tights for the first time in about 25 years. This is maintaining, 15 months on from the first Hivamat treatment. I see her every 3rd week, and have managed one 10 day CDT session with her this year - volume loss was measured in the hundreds, rather than tens, of millilitres. Her pain levels are negligible and her general health has improved too. In March of 2010, I was approached by a local District Nurse, who I knew socially, asking if I would be able to help her with an 83 year old lady who had a stubborn venous ulcer on her lower left leg. The nursing team had been applying dressings and some bandaging for nearly 9 months, twice weekly. I visited the lady and used the Hivamat200 on the leg, daily for a week. After 7 x 20minute treatments the ulcer had shrunk and healthy skin was forming; the surrounding oedema in the lower leg, ankle and foot had disappeared. Sadly this lady was not very compliant - the only exercise she had was walking to the door to let me in (all other carers and family members had keys!) or going to the bathroom. The remainder of her day was spent sitting with her legs tucked under the chair, and her affected leg crossed over the ankle of her right leg. Following a weekend of no dressing changes or visits from me, the ulcer deteriorated again, and cellulitis set in. I attended her daily for some months, but agreed with the DN's that really we were on a hiding to nothing. However, I did learn from this that the Hivamat200 can have a dramatic influence on the improvement of venous ulcers, especially if initially used in conjunction with Suprasorb dressings - available through Activa Healthcare. In April, a young woman travelled from Dublin, stayed in a nearby hotel and had 4 days of twice daily treatments for breast cancer related lymphoedema. Her lymphoedema therapist in Dublin was keen that she try it before her other option - liposuction - which was scheduled for later that month at a hospital in Lithuania. The results were (her word) astonishing. The surgery was cancelled. Her Personal Unit, was delivered to my clinic, so that she could take it home to Dublin. The treatment was curtailed slightly, courtesy of a volcano called something unpronounceable in Iceland - but I made arrangements on her behalf, and she got back to Dublin via buses and ferries, clutching her Personal Unit. She uses it every other day and has continued to reduce in volume. One of my clients, since his surgery and treatment for penile cancer in 2007, has taken up running marathons for charity - the Hivamat was so effective on his lower limb lymphoedema that he invested in his own Personal Hivamat Unit - but still comes to me on a monthly basis for treatment, mainly for the banter I think! Numerous other conditions have benefitted from the Hivamat200: carpal tunnel syndrome; frozen shoulder; arthritic knees; arthritic feet (one particular sufferer was a 78 year old lady who found walking extremely painful - after one 40 minute treatment with the Hivamat200 she went to Tesco and walked around for more than an hour pain-free - she actually wrote a Thank You card to thank me and the Hivamat for allowing her to do something 'normal'! ); constipation; primary facial lymphoedema (very rare, but responds well to regular Hivamat200 treatment); headaches; toothache; tooth extraction pain; period pain....... I could go on. Suffice to say - I LOVE my Hivamat200!" Lynora runs her own clinic, JTH Therapies, near Kinross, and is mobile throughout central Scotland. Lynora specializes in treating Lymphoedema and other chronic conditions. 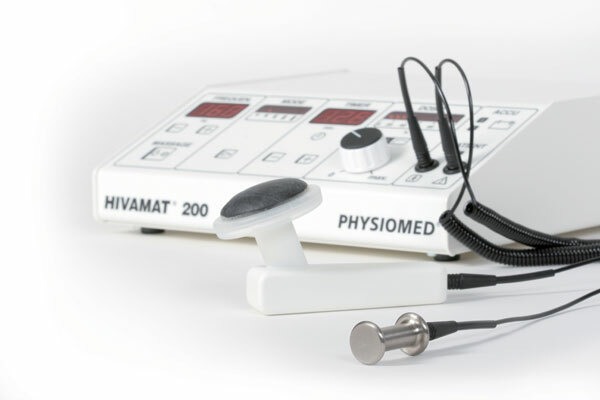 The Hivamat 200 - reducing the requirement for bandaging for Lymphoedema patients. Lynora trained her client and partner with the personal unit enabling easy mobile treatment of her Lymphoedema, the client remains delighted. After two years of using DEEP OSCILLATION® this Lymphoedema Sufferers "would not be without it"
Lesley continues to achieve successful results for her patients..
"Deep Oscillation is amazing, I have used it for oedemas of all types"